recipe you'll ever make. 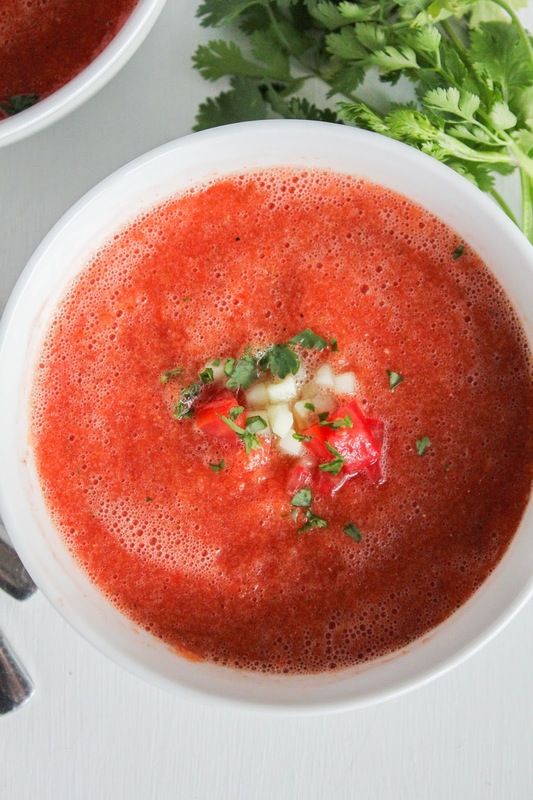 Packed with flavor and full of vitamins and nutrients, it's like summer in a bowl. Strolling through my local farmers market there are so many gorgeous fresh fruits and vegetables to choose from this time of year. Sometimes I just find myself standing there in awe, staring at the colorful array of produce just begging for me to bring it home. Anyone else feel that way this time of year? This is just one reason why I love summer so much. After a recent trip to the market, and going a little bit crazy with my purchases, I found myself with an abundance of veggies. I tossed around several ideas of what to make, and came to the conclusion that Gazpacho soup was what I needed. 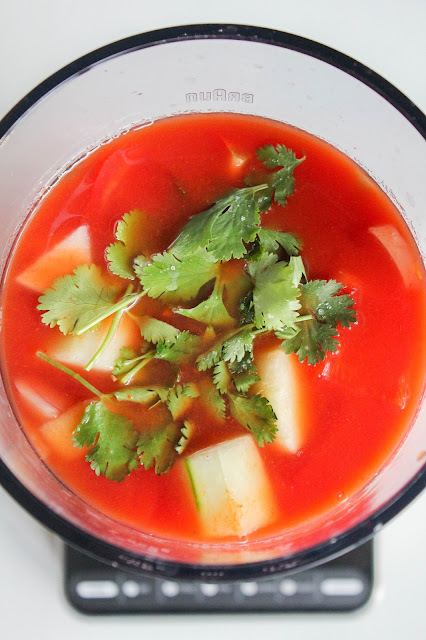 It is full of flavor, so light and refreshing, and packed with vitamins and nutrients. Bathing suit friendly? YES! Earlier this week I shared that Braun recently launched a brand new kitchen collection of awesome products. (In case you missed it, I made these delicious Caramel Coffee Milkshakes!) With Braun, it’s never been easier to elevate an everyday recipe and try new techniques, because the products help you save time and energy by doing most of the hard work for you. The new kitchen collection includes the BrewSense Drip Coffee Maker, the MultiQuick 7 Hand Blender, and the PureMix Blender. 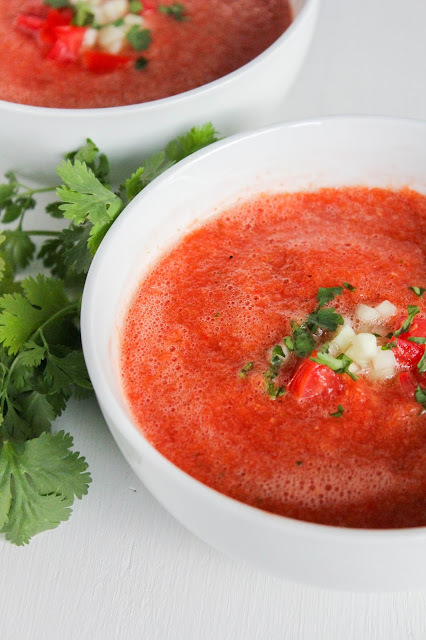 I used the PureMix Blender to make this Gazpacho and it couldn't have been any easier! Are you ready for this? 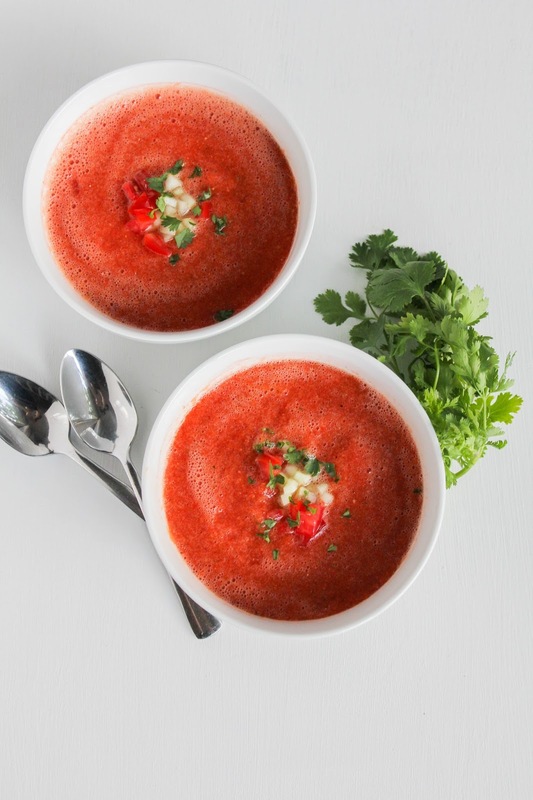 There are two steps to making this soup. TWO! First, give your veggies a rough chop and toss them into the blender with the rest of the ingredients. 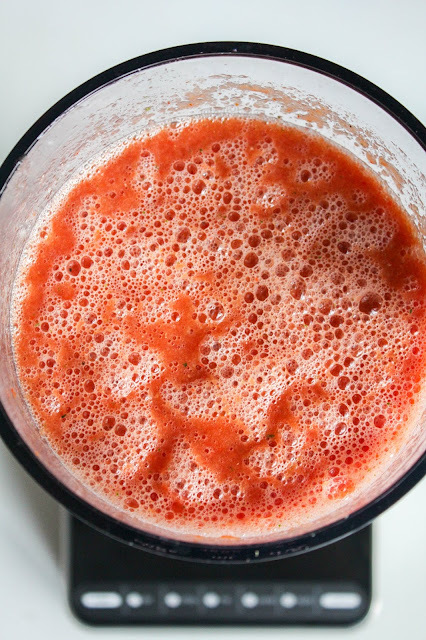 Next, hit the Purée button and let the blender do all the work! That's it! Once you've puréed the soup, it needs to chill in the frig for a couple of hours to let the flavors meld. After that, you are good to go my friends! Delicious soup for everyone. I added a few extra finely chopped veggies on top, as well as a sprinkle of fresh cilantro, to add to the presentation. Gorgeous isn't it? Add everything to the blender and purée until smooth. Adjust the seasoning to taste with salt and pepper. Cover and chill completely, at least 2 hours but the longer the better. 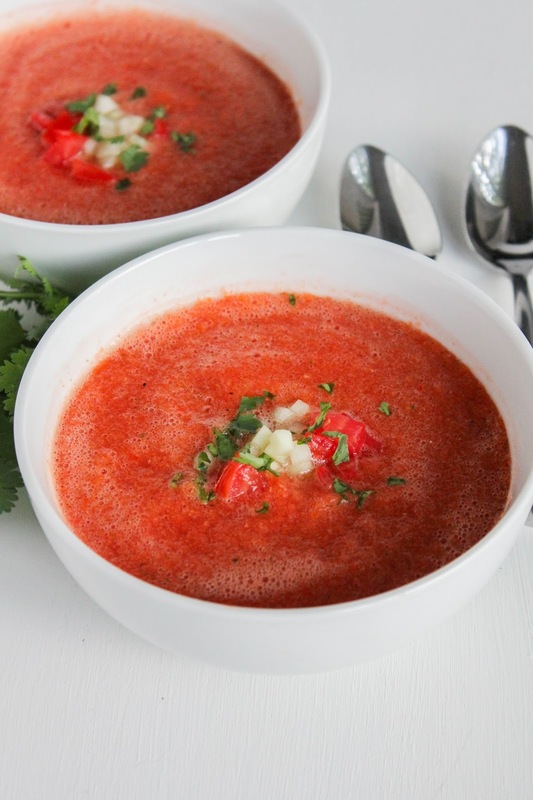 Serve in bowls and top with additional finely chopped vegetables and cilantro, if desired. Learn more about Braun's new kitchen collection by visiting their website. You can also find them on Facebook and Pinterest. This is a sponsored conversation written by me on behalf of Braun. The opinions and text are all mine.